We don’t have a fancy set of glassware at my house. It’s a hodgepodge of glass and plastic. Mugs and cups. It would probably look silly if we hosted a fancy dinner party. The nice part is that it’s hard to get your drink mixed up with someone else’s when they are all different sizes, shapes and colors. Today’s Maximumble has a bright future. I served him poison in a sippy cup. This comic is amazing. I thought it should be said. Our cups are all mugs/glasses/plastics of different shapes, colour and size. We also have three times as many as we need (four siblings moved out and took no cups with them). This is good for when my four-year-old sister insists on getting the fragile cups herself. We don’t need them all, so it doesn’t matter when they break. Ugh, I hate it when I open the cupboards at friends and find plastic cups, I want to use a glass one but feel rude seeing as they are clearly exclusive items and thus should be reserved for the hosts. Poison should always be served in a silver chalice, from the left, and placed on lace. 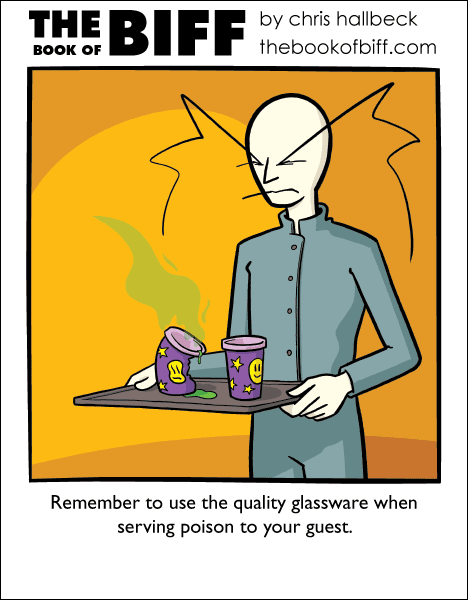 Just remember to match your fatal roborant to the appropriate vessel – The flouric acid actually requires that you use the cheesy plastic stemware. When serving poison to your archnemesis, be sure that you yourself have an immunity to the poison, and then put it in both cups, just in case he tries to switch it. Yup, looks likes super villain week. Iocane powder is very hard on cheap plastic cups. Gee, Biff has an evil side. Dr. Biff? Biffinger? The Biff With the Golden Gun? Why do movies always feel obligated to do that? “It was poisoned, see? Just in case you couldn’t tell that from the guy DYING, lets show the spilled portion on the table dissolving it! Poison and acid are the same thing, right?” Please. @Enya; To be fair, some acids are very poisonous. Fluoric acid, besides having a nicely corrosive effect on things like glass (Yes, *glass*), is also a calcium metabolism inhibitor, leading to systemic toxicity and cardiac arrest. It’s a real-world functional cliche! Is Biff dressed as Dr. No?